Thanks for visiting TEL Woodworking & Conservation's online store. If you're looking for top-quality waterfowl nesting structures, beehives, birdhouses, and predator guards, you've come to the right place. I strive to provide a product that is attractive, practical to use, built for longevity, and most importantly, is highly effective. The last few years have brought a lot of changes for T.E.L.. As my personal life and interests have evolved, I will be phasing out the custom woodworking portion of my website. The transition will take some time, and T.E.L. Woodworking will be known as T.E.L. Conservation within a year or two from the Spring of 2015. Building heirloom quality custom pieces has been an interest of mine since my younger days, however, finding the time to put the neccessary effort into these projects for customers is something I have been having trouble doing, and I want to keep my focus on items that can have the biggest impact for wildlife. A new web address, and an overhaul of the website itself will be on the horizon as well. I hope to make it more smart phone and tablet friendly, and streamline the ordering process by making credit card payment an option for customers. One thing that will never change is my commitment to quality- every item is hand made by myself, with nearly 100% American-made raw materials. This may cost a small amount more, but I believe that most of my customers would agree that it's worth it. 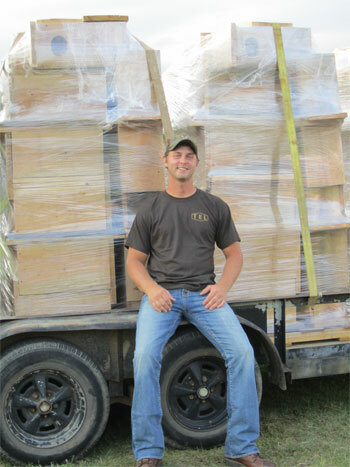 Preparing to deliver 150 cypress wood duck nesting boxes & predator guards to a customer on the Louisiana Gulf Coast in May, 2011.